For some crazy reason, I thought that I should spread these out just in case I didn't have time to craft and I could show them all to you one at a time. Well, I guess I forgot that I have FOUR DT days on my blog. Whoops! Then I like to do FWF on Fridays and I think I'm gonna have something special starting next Sunday, so that leaves me with just Monday as a free day on my blog. Long story short, here's the WCMD challenge cards I made before they become super old news! This was for the Flourishes challenge. Julie gave us a sketch. This was for the MFT challenge. 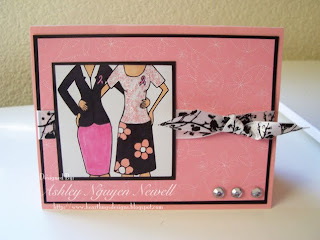 The challenge was to use black, pink and white. 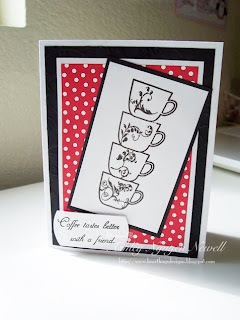 This was for the Hanna Stamps challenge to use a sketch. I have a lot of creating to do to get myself ready for this week! :) Have a happy Sunday! Aww cute cards. Love the cup stack. 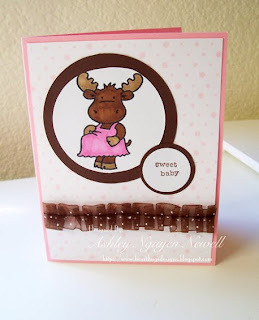 I love that sweet little moose...super cute! Plus the ruffled ribbon is a great accent! Great take on all the challenges. Thanks for this inspiring eye candy. Go Ashley!!! You have been a busy. They are fabulous!!! Love all your creations for WCMD. You've been busy! These are amazing! I love them all!